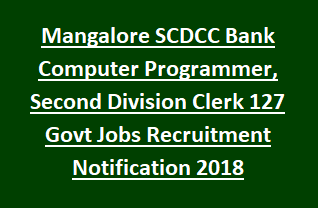 this SCDCCB Bank Recruitment 2018. Category wise clerk vacancies are given in the notification. Candidates should have age limit below 40 years for SC/ST, 38 years for BC and 35 years for other candidates as on 18-12-2017. Interested candidates have to apply for this SCDCCB Bank Second Division Clerk Jobs using the official website http://www.scdccbank.com/. Application forms available from 18-12-2017. Last date to send application forms is 10-01-2018. Application fee for SC/ ST candidates is Rs. 300/- and for other category is Rs. 500/- . Candidate selection for SCDCCB Bank Recruitment is based on written test and Interview. For more information of application fee, application procedure, Selection Process, Age limits of South Canara District Central Co-operative Bank Ltd SCDCCB Second Division Clerk Recruitment jobs are stated below. Total no of vacancies: 127 posts. 1. Computer Programmer: 02 posts. Computer Programmer: MCA from recognized University or BE or MSc in computer Science with 50% marks. Candidate must have three years experience in Computer programmer and also good experience in SQL data base & Oracle. Second Division Clerk: Degree with minimum of 50% marks (aggregate of 3 years) from any recognized University. (OR) Post Graduation Degree with minimum 50% marks and Diploma in Computer Applications and any other computer course for a period of 6 months. As on the Notification date 18-12-217 candidate should have the upper age limit below 40 years for SC/ST and 38 years for BC category. For others 35 years. Candidates applying for South Canara District Central Co-operative Bank Ltd SCDCCB Recruitment is based on written exam and Interview. Interested candidates applying for SCDCC Bank Jobs may go through the official website http://www.scdccbank.com/. Apply for the above vacancies from 18-12-2017 and last date for application submission is 10-01-2018.